The month's almost over and I'm still not finished with the next page so I thought I'd make another update to inform you guys on the whys but also on the actual progress I made in this time. So first to the PROGRESS because I think that's what you're mostly interested in: As you can see on the left, I am still actively drawing on the comic. It's the first Irma page, the first Adventure page and by finishing this panel here I am through with the worst and about half way through the page with the lineart. Also I made progress on other parts related to the comic. 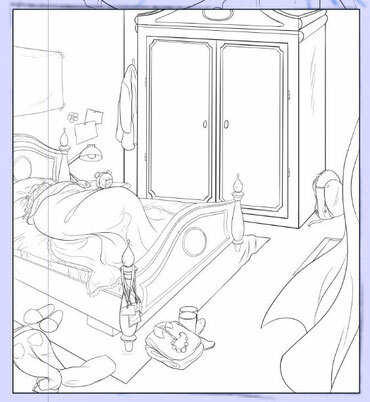 I have a list of questions that I want to clarify for myself to work with the comic for example things like "What happened to Elyon's house? New tenants or abandoned and ghosty?" OR "Should character XY from the original comics play a role in the new comic?" OR "What happened to person XY in the meantime?" Some of these questions can be answered by creativity of cause and by decision making, while others require some research in the original comics. So I answered about 10 of those questions both with creativity and research in the past week, gathered some additional ideas, discovered some important facts I almost ignored from the original comics (that was a close one!) and structured my documents and ideas so I can find them faster in the future. As you might know, I'm looking for a job for a while. I've been in a further education training thingy until early June and started applying for jobs in May so I had exams to study for and interviews to prepare for. Also, you might know that anxiety one gets when going to a job interview and the emotional relief once its over. I really like this kind of stuff but even for me these past weeks have been really exhausting. I had meetings every single day plus family stuff on the weekends so there was almost no energy left for myself. I actually got a small stress reaction last weekend which is like a giant red light that starts blinking "Alert! Alert! Stress meter rising!" This week I can finally breathe a little. I have several things going and it's looking good that I'll have a job starting July 1st. So yey! It was still annoying that I didn't have more energy to work on the comic but at least I managed to make some progress even if it's just a little one.